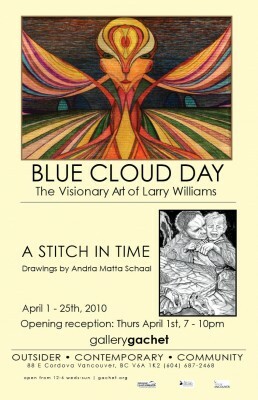 April 2010, Gallery Gachet showcases two diverse yet confluent artists, Larry Williams and Andria Matta Schaal. Williams is the quintessential outsider, creating visionary work stemming from his imagination that relates to his own personal inner sanctuary. On the other end of the spectrum, Schaal defines her art through her political ideology and speaks to the outer world in which we operate. Both artists offer disparate perspectives on internal and external human experiences but both surge with the same complex imagery, intricate penmanship and stunning beauty. Matta’s work explores the (anti)-ecology of Empire. Empire – the global entity that some call “progress” that continues to expand and extend control into ever wider and wider territory. This empire knows no limits. It seeks no balance. It demands broader pools of victims and further extraction of resources, always with a complete and utter disregard for the healthy relationships between living things. It is this complex relationship between living organism and the global entity of capital that Matta’s work explores. She speaks to issues of the environmental destruction, colonisation, displacement, extinction and occupation because she finds these harsh and heavy realities. Combining these dark themes with the vapid illusions and grandiose ambitions of today’s society make for biting and provocative art. This series of pen and ink drawings from Vancouver’s upcoming artist, Schaal leave you with a chilling degree of uncertainty about the future of civilisation, as we know it.